Rio Ferdinand opened the conversation about modern captains and playing with Roy Keane at Manchester United. Having played with West Ham and Leeds prior to joining United in 2002, the legendary England centre-half had worked with the likes of Steve Potts, Julian Dicks, Steve Lomas, Paolo Di Canio and Lucas Radebe. Ferdinand, speaking on BT Sport revealed the impact former United captain Keane had on proceedings. “I look at Roy Keane, and his powers were on the decline probably as a player, an individual, but it was more about his influence, and what he demanded of people. 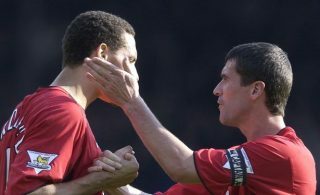 Although Ferdinand admitted that he could handle Keane and it drove him on to be a better player, others were less receptive to such methods. Working with Keane – no matter the capacity – is about to throw up mixed views. His methods as a coach are outdated, it would seem, but he will forever go down as a great United captain – even if Ferdinand refused to suggest that he was any better or worse than the other captains Ferdinand experienced first-hand.